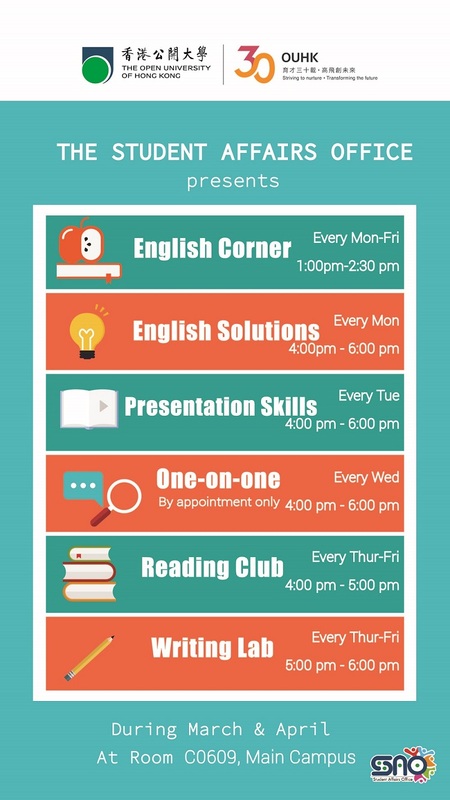 The English Corner is a place for you to practice your language skills while talking, playing games and sharing snacks with other students and experienced English speakers. Your English level is not an issue here. Please come and join us every weekday (Monday to Friday) from 1:00 to 2:30 pm. Hope to see you there! If you want a more personalized help on your writings and presentation please book a time on the English One on One, a place offered for you to come and seek advice on your language needs with one of our English speakers. To access this service please write an email to englishcorner@ouhk.edu.hk and make an appointment at least 2 working days in advance attaching a formal proposal/paper you desire to work on. If you finished your papers and want an extra pair of eyes in your work, this is the place for you. Feel free to walk in with a printed or soft copy (laptop and tablets only). Presentation Skills - Practice makes perfect. Let us help! If you want to be more confident and fluent in your presentations, please come, practice with us and get some tips to excel. Bring your PowerPoint presentation and speech with you to make it even more customized. Reading Club and Writing Lab - Basic skills practice is always a plus! These are activities that can help you practice these important basic skills. Please come and learn some tips on how to master them.